No, this isn’t a fanatical effort by the Christian right. 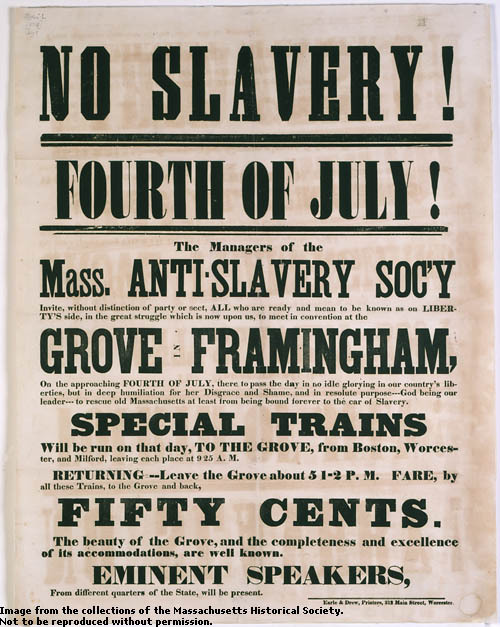 The sin, of course, was slavery; the movement was abolitionism; the ultra-extremist wing was formed by William Lloyd Garrison and his followers. Garrison, who from 1831 to 1865 edited the abolitionist newspaper the Liberator, was, if not necessarily the most influential abolitionist, certainly the best-known and most hated. He exercised no direct political influence; his fame rested entirely on his activities as a publicist and agitator. But in proselytizing the evangelical-inspired doctrine of “immediatism,” which characterized slavery as a sin and hence demanded that slaveholders at once stop sinning and emancipate their slaves (the doctrine echoed revivalism’s call for “immediate repentance” and “immediate abstinence”), Garrison, along with Theodore Dwight Weld, Lewis Tappan, James G. Birney and Elizur Wright Jr., revolutionized abolitionist thought and rhetoric in the United States. Before the advent of immediatism, antislavery thinking was mired in realism. “Antislavery” meant “colonization,” which called for gradually emancipating slaves and then colonizing them in Africa or elsewhere–an idea embraced by virtually every major political figure from the Revolution to the Civil War, including Thomas Jefferson, James Madison, James Monroe, John Marshall, Andrew Jackson, Henry Clay, Daniel Webster and Abraham Lincoln. Because colonizationists gave full consideration to prevailing economic, political and social realities, they regarded the freeing of the slaves to be an insoluble problem that would have to wait to be resolved by the greater wisdom of future generations. Therefore, “gradual” emancipation in fact meant at best glacial emancipation. The abolitionists saw things entirely differently. Infused with a sense of sin, they didn’t regard slavery as a public policy problem or even simply as a great injustice but as an evil. Their Christian millennialism, however, promised them that they could hasten the coming of God’s kingdom if people would cleanse themselves of their sins through direct access to God and hence be “born again” into a life of holiness. This conviction led them to believe that slavery would end when, and only when, slaveholders recognized their Christian duty and redeemed themselves from sin. And because of their faith in the radical and transformative power of Christianity, they also held that all white Americans, through a “second birth,” could subdue their seemingly insurmountable racial fears and hatreds, ushering in a biracial society reborn in Christian harmony. In short, whereas many colonizationists, as products of the Enlightenment, readily acknowledged that slavery contradicted the Declaration of Independence and that blacks should in principle be granted their natural rights, only the abolitionists, as Christians, possessed a worldview that demanded, to use their own pleas, that the African American not only be recognized as a man but also that he be treated as a brother. The effect on Northern opinion of the abolitionists’ campaign of “moral suasion” is difficult to gauge, but, by castigating equally the sinner and the sin, it clearly raised the hackles of white Southerners and helped produce an atmosphere that would engender an ideological Cold War between the sections. Garrison, for his part, by advocating such radical (most abolitionists would have labeled them insane or at best extraneous) causes and doctrines as women’s rights, Northern secession, anti-clericalism and a form of Christian anarchism known as “non-resistance,” continuously roiled the abolitionist movement and, depending on one’s point of view, intellectually and spiritually reinvigorated or poisoned it. 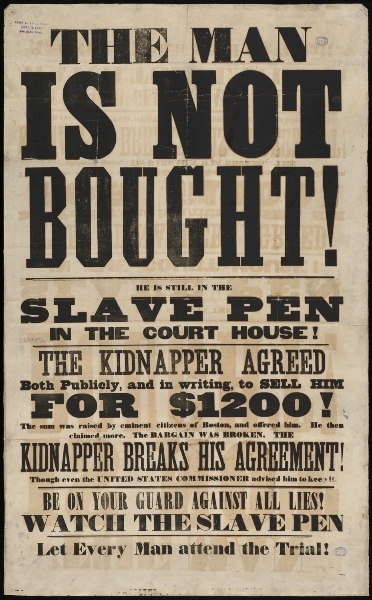 Regardless, abolitionism was eclipsed in the late 1840s and ’50s by such “impure”–and often racist–forms of antislavery as those of the Free Soil and Republican parties (after all, Lincoln, the most successful antislavery politician, declared that “abolitionist” was “an odious epithet”). Nevertheless, the abolitionists–Garrison as well as his estranged colleagues–ensured that the plight of African American slaves and the notion of racial equality could not be ignored in what were arguably the most racist decades of Northern U.S. history. From the opening pages of his book, Mayer, who tells us that he is “a man whose political consciousness was shaped in the civil rights and antiwar movements of the 1960s,” forces Garrison into the mold of crusader for “social justice,” like Daniel Berrigan and the Freedom Riders. Drafting historical figures into causes that are not their own is always problematical, and this is especially true in the case of such an eccentric figure as Garrison. “All on Fire” is an unabashed work of hagiography–to Mayer, Garrison is “an authentic American hero,” and he characterizes the book as an attempt “to reinvigorate” his subject’s “reputation”–but Mayer is trying to break down a door that, if not already flung open, is at least ajar. Mayer tells us that he is responding to a historical perspective that regards Garrison as “the lunatic fringe personified” who, along with other abolitionists, so inflamed sectional enmity that they destroyed any tendencies toward compromise and hence provoked the Civil War. But this point of view, embraced by “revisionist” historians in the 1930s through the ’50s, was challenged and overtaken by a group of mostly radical and left-wing historians in the 1960s, dubbed the “neoabolitionists,” who, in search of a “usable past”–always a dicey undertaking for historians–celebrated the abolitionists as a sort of 19th century SDS and saw Garrison in much the same light as does Mayer. (In fairness to Mayer, the neoabolitionists’ work on Garrison took the form of historical monographs, so his is the first comprehensive biography of Garrison to take their point of view.) Today, even most historians who find Garrison a personally unpleasant figure believe his “extremism” on slavery and race to be in many ways the most realistic assessment of those issues in mid-19th century America. But it is a shame that Mayer avowedly sought to make Garrison a “hero”–a task that invariably corrupts any evaluation of a historical figure–because he can do so only by underplaying and exaggerating aspects of Garrison’s character, beliefs and contributions to abolitionism and neglecting the contributions of his more often than not antagonistic fellow abolitionists. Despite Garrison’s enlightened racial attitudes, Mayer has set a difficult job for himself. Garrison is a hard man to take a shine to. Frederick Douglass echoed the exasperation of countless other abolitionists when he complained that Garrison and his increasingly small circle of devoted followers talked “as if all anti-slavery ideas originated with them and no man has a right to peep . . . on the subject who does not own letters of patent from them.” Gamaliel Bailey’s concise verdict–“a disgusting gross egotist”–was also no doubt muttered by more and more abolitionists as over the decades Garrison moved to new and increasingly radical positions in spasms of righteousness that split organizations and alienated a remarkably long list of friends and allies. Many of the most valid criticisms by Garrison’s contemporaries go unreported in “All on Fire,” and Mayer strains to give Garrison’s actions and doctrines the most sympathetic interpretation possible. Garrison was self-righteous (he was busy reproving, admonishing and condemning long before he discovered the sin of slavery). He was self-dramatizing (he relished occasions for affliction that would confirm his sense of rectitude–from his writings it seems that perhaps the most euphoric episode of his life was his 49-day imprisonment for libel, as it permitted him to call attention to his martyrdom by composing a Byronic sonnet to intellectual freedom, sending greeting cards to his “persecutors” and comparing himself to the apostle Paul). He was self-aggrandizing (craving fame, he came to his abolitionism in the course of his ambitious attempt to establish his career as an author and not to writing through his dedication to antislavery, as was the case with the other great abolitionists writers and editors–Weld, Birney, Elijah Lovejoy, William Jay Wright, Amos Phelps, Joshua Leavitt, Bailey and Nathaniel P. Rogers.) And he was self-important (he repeatedly compared himself to Jesus, and in the Liberator he often appeared to give more attention to himself than to slavery. Of the 33 sentences in his famous declaration in the inaugural issue, for example, 27 contained an “I,” a “me” or a “my,” concluding with the most famous demand for attention in American history: “I WILL BE HEARD.”). In his reference notes, Mayer contends, with some justification, that James Brewer Stewart’s recent study of Garrison “engages in more psychological speculation than the evidence will bear,” but if there was ever a historical figure that cries out for psychological speculation, it would seem to be Garrison (Brewer’s elegant study, along with the brilliant essay by literary historian R. Jackson Wilson that heavily influenced it, remain the two most penetrating works on Garrison to appear in the last 30 years). Obnoxious and disliked as they were, Garrison and a handful of his fellow abolitionists, more than any of their contemporaries, focused on the one issue that more than any other would continue for the next century and a half to confound their country, a fact that, in itself, warrants Mayer’s gigantic if flawed effort. In the face of an ongoing and inevitable kinship, the struggle to assert the separateness of black and white Americans–an idea that has often appealed to members of both races–is, as Ralph Ellison has written, our persistent “national pathology.” For a very long time, the abolitionists’ was the only tradition that sought to cure that pathology. And rooted as it was in evangelicalism–the quintessential American religious expression–it may still be the most powerful tradition we can call upon to ameliorate our most tenacious ill. For better and worse, the abolitionists reveal the truly revolutionary and extreme potential–as well as the limitations–of evangelicalism as a force in American life. Although often during the past two centuries its adherents have upheld inconsistent visions for this country, always, in their hunger and thirst for righteousness, they have demanded that Americans lead their lives, as the saying went, “with eternity’s values in view.” And thus always, for better and worse, they have demanded a country utterly unlike the one Americans have lived in. Observing the United States in the year that Garrison began publishing the Liberator, Alexis de Tocqueville, in a conclusion that could apply to much of modern America, noted with despair that “the two races are fastened to each other without intermingling; and they are alike unable to separate entirely or combine.” He recognized this limbo to be “the most formidable of all the ills that threaten the future of the Union.” Garrison and his fellow abolitionists held that no mere political process could repair the situation Tocqueville described. To Garrison, Christian justice and brotherhood alone could wash away the color line and make black and white Americans truly one people: “There is power enough in the religion of Jesus Christ to melt down the most stubborn prejudices, to overthrow the highest walls of partition, to break the strongest caste . . . to unite in fellowship the most hostile, and to equalize and bless all its recipients.” Perhaps the works of man alone–our Bill of Rights, our Constitution, our Declaration of Independence–can do the same. But Garrison and the abolitionists didn’t believe so, and I suspect that when Americans–inhabitants of a country in which the roots of Christianity are sunk more deeply than in any other Western nation–hear the better angels of their nature, they yearn for the Promised Land to which Martin Luther King Jr. gave imperishable expression, a vision, like Garrison’s, rooted in religious conviction rather than in progressive political principles.